Little Squealer Snare 7" X 13"
The 13"x7" Pork Pie Little Squealer Snare Drum is crafted from 8-plies of maple. 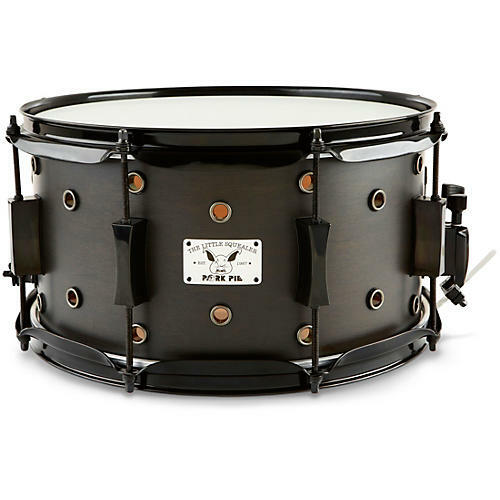 This Pork Pie snare boasts a black ebony satin finish, all black hardware, cast hourglass lugs, and 2.3mm heavy-duty hoops. Bearing edges are hand sanded and precision cut. Pork Pie builds the Little Squealer snare with painstaking attention to detail. Pork Pie snare drums are coveted and played by drummers all over the world. Like fine wine, there is no questioning an authentic Pork Pie snare. Pork Pie snares are known for their true sounds. Whether recorded or live, the difference in your sound can be credited to your custom Pork Pie snare. Hearing is believing!